Following a red-blooded display of fire-breathing exhausts and smoking tyres on Top Gear (BBC2, 4 March), the aero-engined BMW 'Brutus' will be making a star appearance at the Cholmondeley Pageant of Power (15 to 17 June; www.cpop.co.uk), the UK's biggest celebration of power and speed. The three-day Pageant will play host to a weird and wonderful collection of early 20th-century cars that are powered by aeroplane engines, with the 500bhp Brutus taking centre stage on the track and in the paddock. Germany was forbidden from creating military aircraft after World War I, so, with large numbers of aeroplane engines spare, this 46-litre experimental project was created. 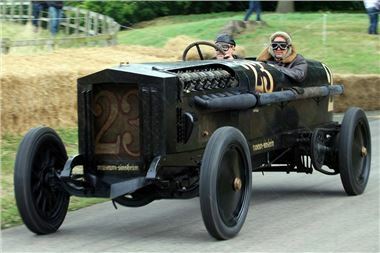 Other aero-engined cars at the 2012 Pageant of Power will include a 23-litre Maybach Zeppelin (affectionately known as 'Chitty Bang Bang 1', one of four celebrated 1920s English race cars believed to have inspired the creation of the fictional Chitty Chitty Bang Bang), a 24-litre Napier-Bentley and a fearsome 42-litre Packard-Bentley. Including Brutus, the combined power output for these four cars totals more than 2,800bhp. James Hall, Event Director for the Cholmondeley Pageant of Power, said: "Aero-engined cars are a rare breed, but these are some of the most fascinating and exhilarating machines people are likely to ever encounter. We can't wait to see what the crowds make of these unique cars, as there is simply nothing else on the road that can match them for sheer drama."